We are frequently asked to perform at wedding receptions until 1.00 am. Quite often this is a last minute change of plans as suggested by function managers/co-ordinators, as the original booking was until midnight. Having been in the wedding business for 42 years, in our opinion it is not a good idea to extend the finishing times after you have sent out all your invites. In fact we try to encourage our clients not to have a 1.00 am finish from the outset. it may seem like a good idea to keep the party going but there are many reasons why we would advise against it. Firstly many of your guests including yourselves and the bridal party will have been up since the early morning getting ready for the big day. Many of your guests will have travelled quite a long distance either by driving themselves or by arriving by coach laid on by the bride and groom. depending upon where your guests are coming from and where the pick up points are for the coaches, some of your guests could have been travelling for several hours. Guests of a certain generation may find it difficult to envisage staying on until the early hours of the following day and will tend to start to leave around 10.30. to ensure that they get home safely. Other guests may have very young children with them who will start to tire or have babysitters at home which means that they will dwindle away as well in order to let the babysitter home for a reasonable hour. 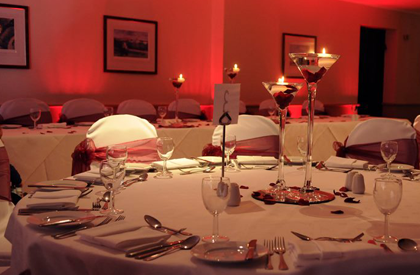 If you are having your wedding ceremony, wedding meal and you evening reception all in the same venue, this can be quite claustrophobic for many people as they will have been in the same building for anything up to 12 - 13 hours. If you are getting married elsewhere such as a church or registry office this will mean adding extra travel time for your guests. Bare in mind also that if you are providing coaches for your guests and you finish at 1.00 am, the last person may not get off the coach for another couple of hours depending on how far the coaches have to travel and drop off points. It is better to finish your night on a "high" with as many guests as possible still with you than to ads an extra hour on and watch your numbers drop, sometimes into single figures. Some venues will try to encourage a late finish at your final meeting, in an attempt to try to sell more alcohol, but the wise venues realise that this doesn't happen as most people attending a wedding/function will only have a certain amount of money with them and when it runs out it runs out., so they will sit with one drink for the last hour. From an entertainers point of view, we could charge extra for that extra hour, in fact many bands will charge double their hourly rate per member of the band which can add quite a substantial amount to your final bill. However we would rather finish with as many people as possible and give you an ending to your night to remember.